Review from "No More Grumpy Bookseller" ! A great review for TLC Book Tours from "No More Grumpy Bookseller"
March loves trees. He knows everything there is to know about their ecosystems, the various species, and anything else pertaining to them. His real passion is climbing them, mapping out the routes in his head and planning which to tackle next. His absolute favorite tree is the Ponderosa Pine. A rare and endangered tree, he never thought to see one in his home state. But while climbing the tree in his new backyard, he catches sight of a magnificent specimen. Known locally as the Eagle Tree, March believes it might be an elusive Ponderosa Pine. 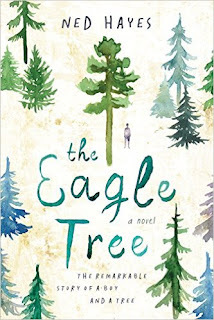 But when the land the tree sits on is purchased privately and under contract to become the site for a new development, March realizes the Eagle Tree is in grave danger. March's sole focus is saving the tree, no matter the cost, but doesn't realize that it could mean losing his mother in the process. There's not really a way to sum up Ned Hayes's latest in a manner that truly does it justice. Yes, it's about a boy and a tree. It's about an autistic boy who connects to the world through trees. It's about an autistic boy being raised by his single mother who is facing the very real danger of losing her son to the courts. And it's told from the perspective of March himself. Because of this, the reader is forced to see the world through March's eyes. Pieces of his story, as a result, are gleaned through inference or by piecing together clues March allows us to see. In between facts about trees and global warming, that is. It might sound strange, and again I blame the fact that it's very hard to sum up adequately in a nutshell while conveying exactly what makes this book so special. I loved it. Absolutely and completely. And honestly, though I'd read and enjoyed Hayes's previous work, I really wasn't sure that this one was going to appeal to me. I'm glad my apprehension was proven to be without merit! I really thought that Hayes did a magnificent job with March. Without experiencing it ourselves, many of us will never truly have a good understanding of autism and how it affects people. Hayes, through March, gives readers a chance to see that first hand and to understand how a mind like March's works. And though we don't see the story from March's mother or uncle's eyes, we do see, through March, how his autism affects them as well. It's a unique perspective that could definitely have had grave faults to it. Hayes, though, manages to handle it with respect and honesty, making March a real and sympathetic character. For more on Ned Hayes and his work you can visit his website here. You can also follow him on Twitter.